Treatment demand for alcohol decreased by 8% in 2015 compared to 2014. This decrease is 20% among young people under the age of 25 years and 4% among people 55 years and older. Alcohol continues to be responsible for the largest group of clients in addiction care. 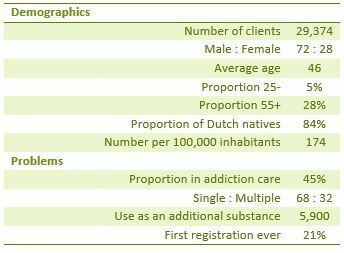 Of the total of 65,000 clients in 2015, nearly 30,000 request treatment for a primary alcohol treatment demand. This is 8% less than in 2014. Approximately 30% of this group are women. The average age of the group of alcohol addicts requesting treatment has increased over the past few years and is now over 46 years. Alcohol problems leading to a request for treatment are only found to a relatively limited extent among the group of younger people. The percentage of younger people under the age of 25 is 5%. Compared to 2014, the treatment demand for this age category declined by 20%. The percentage of older people (55 years of age and older) with an alcohol use related treatment demand was 28% in 2015. The decline in the number of people requiring treatment in this age category is relatively smaller. More information about the treatment demand on alcohol can be found here.